OB Rag and City agree to delay any trimming or cutting of Long Branch Torrey Pine until Planning Board meeting on issue. 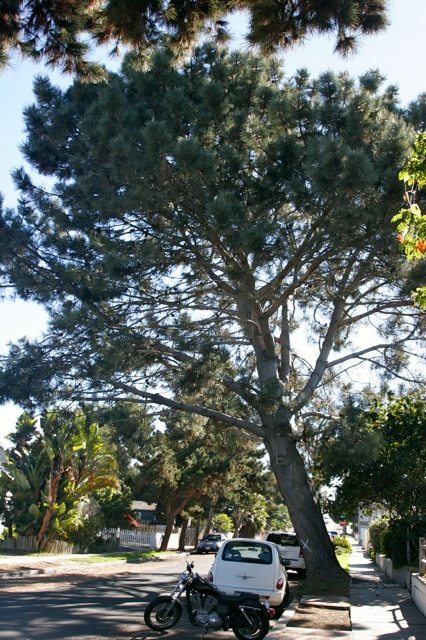 The OB Rag and the City of San Diego’s urban forester have come to a temporary agreement about the towering – but leaning – giant Torrey Pines tree on the 4600 block of Long Branch Avenue. We have been following the story that the City wants to either drastically trim or even cut down this magnificent beauty. But an agreement has been made between us and Drew Potocki, the City’s urban forester, to put off any decision about doing anything to the tree until Drew can prove to the community that drastic measures must be taken. We have agreed to utilize the forum provided by the Ocean Beach Planning Board. Here Drew can make his case and community members can respond. Potocki – a well known and respected arborist – has claimed that the Torrey Pine’s roots are so damaged and weak that most of the foliage on the north side of the tree has to be cut. If this occurs, most of the trees’ canopy – and beauty will be destroyed. Potocki says that the trimming must occur in order to save the tree and prevent any damage to people and property below. The tree does lean north but is still very much alive. Local activists are extremely concerned about this tree and are gearing up to retain a Torrey Pines specialist to evaluate the tree. We have contacted the Ocean Beach Planning Board – the tree is in District 3 – and have requested that the Board place the tree on its agenda. We are currently waiting for a confirmation. Once on the agenda, Drew can prove to the community that drastic measures must be taken. Community members can respond and give their own reports about the tree. Potocki claims he has 3 independent opinions from experts who say the tree must be cut down. In the meantime, check out the history of Torrey Pines in Ocean Beach here, and check out how contractor crews have trimmed the Torrey Pines trees on the 4600 block of Saratoga Avenue. And stayed tuned about this giant beauty on Long Branch. Well, I can see how a lot of the tree overhanging the street would have to go in order to re-train it to start growing up instead of out. I agree that it would fundamentally alter the canopy in a way that might not be visually appealing for the next several years, but in a list of options that also include killing the tree off completely and starting the countdown for the day it inevitably comes crashing down on cars, houses, and potentially people, I think trimming is the least undesirable option. Newer Article: Memo to mainstream media: Could we have just – say, one week without anything about Sarah Palin?